Maersk Line’s containership Venta Maersk has almost completed her maiden voyage from Vladivostok to St. Petersburg through the Northern Sea Route (NSR). On 22 September the vessel arrived at Bremerhaven, having successfully passed the Arctic Ocean from the Bering Strait to the Norwegian Sea, and now on the way to St. Petersburg passing by Sweden, according to MarineTraffic. 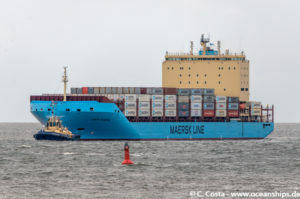 This is the first Maersk vessel passing the NSR and, according to the shipping company, this unique passage is just a one-off trial aiming to “explore an unknown route for container shipping and to collect scientific data”. As we wrote a year ago, СOSCO’s dry cargo carrier Lian Hua Song had passed from China’s port of Lianyungang to Russian Bronka port along the NSR for the first time in the history of the two countries’ relationships. Now, Venta Maersk has become the first containership to navigate the Arctic sea route. The newly built (2018) 3,596 TEU ice-class container vessel is specifically made to serve as a feeder vessel for the line’s Baltic Sea services. Venta Maersk loaded frozen fish at the Vladivostok Sea Fishing Port, at the Far East of Russia on 23 August, then called at Busan, South Korea, to load electronics and thereafter headed north. 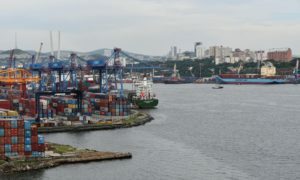 The vessel completed the NSR sailing along Russia’s north coast from Busan to the Norwegian port of Kirkenes within 18 days. The whole route from Busan to St.Petersburg is estimated at about 30 days. Up to now, the passage has been largely reserved for tankers and gas carriers but now is becoming more popular, due to the reduction of ice in the Arctic, shorter transit times as compared to the Suez Canal, and the development of port infrastructure that is being implemented by Russia. At the same time, just recently Russia has announced that since 1 January 2019 it will ban sailing of foreign-made vessels within the Russian waters. The ban is aimed at protecting the national shipbuilders, however scarce they are. Although this includes the NSR waters, Vice Prime Minister Yuri Borisov commented that initially, some types of foreign vessels would be allowed to pass the Northern Sea Route. How long this initial period will last and what these vessel types are, he has not disclosed.